When Barry Letts and Terrance Dicks decided their time on Doctor Who was coming to an end, they chose to originate a new series, which if it proved successful they could then work on full time. 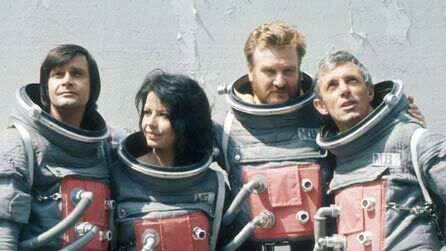 Moonbase 3 was the result, broadcast in 1973, although in the end it only ran for six episodes before being wiped and largely forgotten. It wasn’t until twenty years later, in 1993, that co-producer 20th Century Fox found NTSC copies of the six episodes in their archives – and these prints were returned to the BBC and issued on VHS and then later on DVD. So is it a lost classic or just better off lost? Letts and Dicks always seemed inclined to the latter opinion, but that doesn’t mean that the series is a total write off. 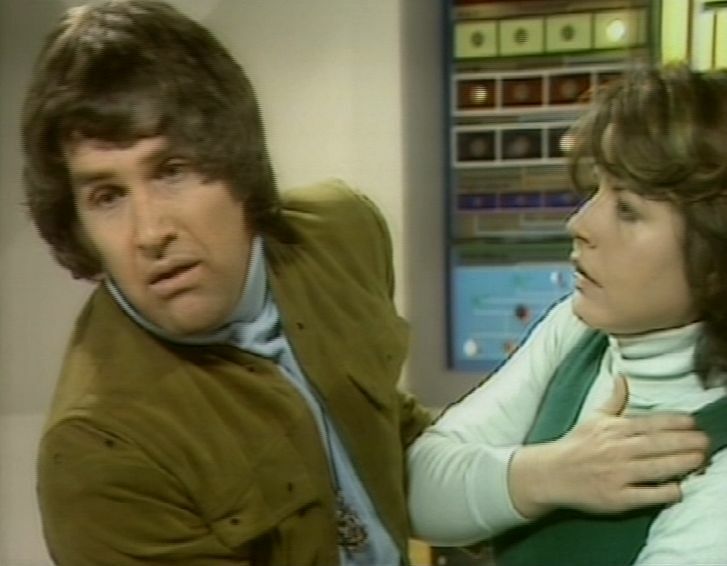 Moonbase 3 has its problems, but for fans of 70’s BBC SciFi there’s plenty of interest. Letts and Dicks’ episode “Departure and Arrival” opens the series. It sees the arrival of Dr David Caulder (Donald Houston), newly appointed director of Moonbase 3. His predecessor has just died in a shuttle accident and one of Caulder’s first tasks is to examine the reasons for the crash. Harry Saunders (Michael Wisher) suffered a nervous breakdown while piloting the shuttle. But was it an isolated incident or do the problems run deeper? The introduction of a new character (Caulder) into the Moonbase setup also allows the viewers to be introduced to all the personnel on the base at the same time. It’s an old storytelling trick maybe, but it’s still effective. The senior staff under Caulder’s scrutiny are deputy director Dr Michel Lebrun (Ralph Bates with an interesting French accent), no-nonsense director of operations and maintenance Tom Hill (Barry Lowe) and base psychologist Dr Helen Smith (Fiona Gaunt). After a quick whistle-stop tour, Caulder puts his plan into action in order to demonstrate to Lebrun, Hill and Smith just how dangerous the Moon is. Frankly, Caulder’s actions are reckless in the extreme as he seems happy to risk their lives just to prove a point. But by the end of the story Caulder is able to close his enquiry on the shuttle deaths, so life on the moon can get back to normal. One of the pleasures of the series is the high quality supporting casts, which includes many familiar faces such as Peter Miles (in “Behemoth”), Edward Brayshaw (in “Achilles Heel”) and John Hallam (in “Outsiders”). But one major problem the series faced was that in order to generate drama and conflict it meant at least one member of the Moonbase staff had to act in an irrational or dangerous manner per episode. Had the series continued it would have been difficult to see how this problem could have effectively been dealt with. The later series Star Cops (1987) solved this by depicting a Moonbase which had a constant influx of departures and arrivals. The closed nature of Moonbase 3 doesn’t allow such freedom though. The fifth story, “Castor & Pollux” sees Tom Hill adrift in space and although Caulder is keen to organise a rescue mission, he can’t do it without Russian assistance. The slowest paced episode of the series (and given the zero gravity environment, none of the others exactly race along) there is nevertheless a mounting sense of tension and it’s the best chance for Barry Lowe to shine. The sixth and final episode of the series is “View from a Dead Planet”, guest starring Michael Gough. When the Arctic Sun Project appears to have destroyed all life on the planet, the Moonbase personnel face the prospect that they are the only human beings left alive – although given the limited supplies they have, this won’t be for long. And then it was over. Critical and audience response were muted to say the least – a BBC Audience Report found the series “banal, predictable and slow”. And viewing figures were fairly disastrous as it debuted at 6 million whilst later episodes dropped as low as 2 million before recovering slightly at 4 million. But for a mainstream Sunday night BBC1 slot this effectively sealed the programme’s fate. Why did it fail to capture the public imagination? The team of Letts and Dicks had worked together on Doctor Who since 1970 and had pulled that series around to make it a ratings winner and an important part of the BBC’s Saturday evening schedule. 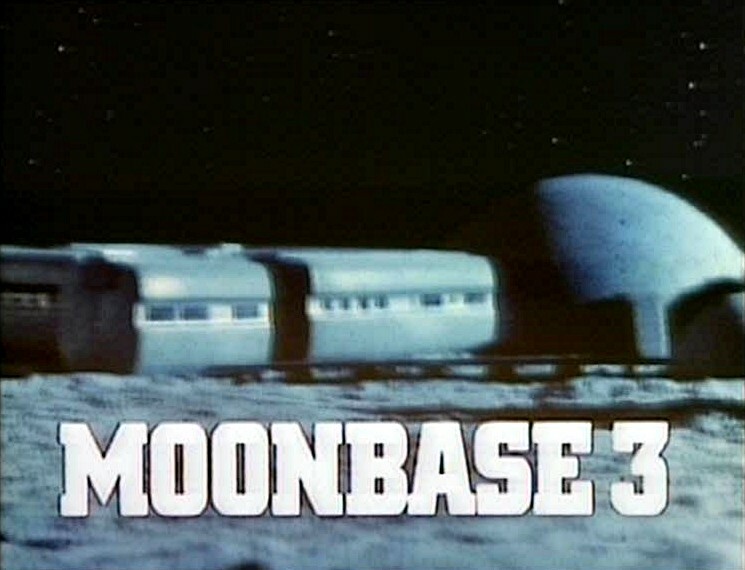 Moonbase 3 was a different beast though. It was hard science fact (with James Burke acting as story consultant) rather than science fiction or fantasy and it didn’t seem to work in the Sunday timeslot. Donald Houston, whilst never the most subtle of actors, had a certain presence and made Caulder a compelling character. The needle and one-upmanship between Lebrun and Hill added some spice and conflict, which leaves Dr Helen Smith as somewhat of a fourth wheel. As her job was to identify which Moonbase crew-members were operating under stress or were potential risks, it’s embarrassing that so many passed her by. Quite how she managed to keep her job is anyone’s guess. Watch out Dr Smith! Another one’s going round the bend! Although it has its problems and weaknesses, it’s still a series that I find myself taking down from the shelf and rewatching most years. Maybe it’s the 70’s BBC futuristic setting, which is now somewhat comforting, but for whatever reason it’s a series that, dodgy NTSC picture notwithstanding, does repay multiple rewatches. The Second Sight DVD has long since been deleted and now goes for silly money, so YouTube is probably the best way to sample this forgotten piece of 1970’s futurism.